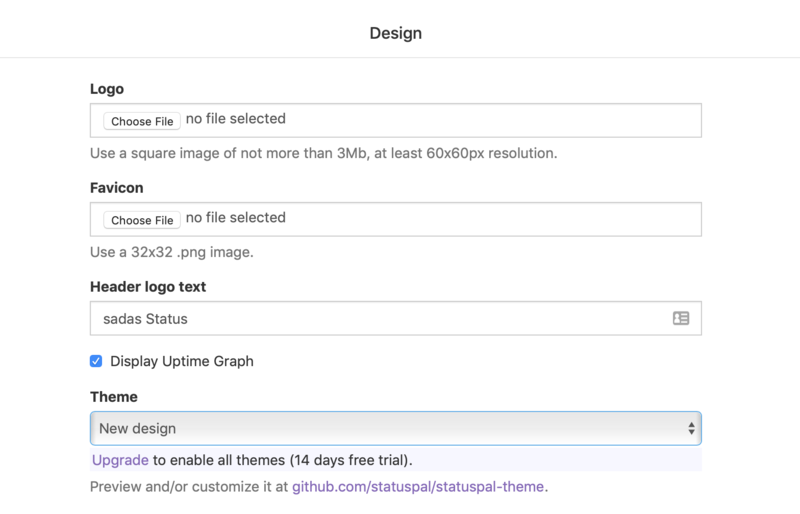 In order to customize your status page got to the Design section in your admin site. Logo: An image to display as your logo in the header. Favicon: An image to use as the browser's favicon (displayed in the tab's tiny icon). Header logo text: A short text to be displayed in the header next to the logo, something like "Yourcompany's Status" should do. Theme: There are currently 2 main options, the new design's theme and an option with a larger logo (big logo) and also features a larger header area. Links color: The foreground color that for the links in your status page. Header background color 1: The first color that will be used as header background, if a color 2 is present then they will both be used as a horizontal gradient. Header background color 2: The second color for the background gradient. Header foreground color: The foreground color for the header. Incident page header color: The color that will be used in the incident page's header. As well as in the incidents and service's status color indicators. Minor incident color: When there is an ongoing incident of type "Minor" this color will be used. Major incident color: When there is an ongoing incident of type "Major" this color will be used. Scheduled maintenance color: When there is an ongoing scheduled maintenance this color will be used.